The EUP3467 is a step-down converter capable of driving 5A continuous load with excellent line and load regulation. The EUP3467 operates in either CC (Constant Current) mode or CV (Constant Voltage) mode with an input voltage range from 8V to 36V. The EUP3467 provides programmable cable compensation by adjusting external resistor divider. 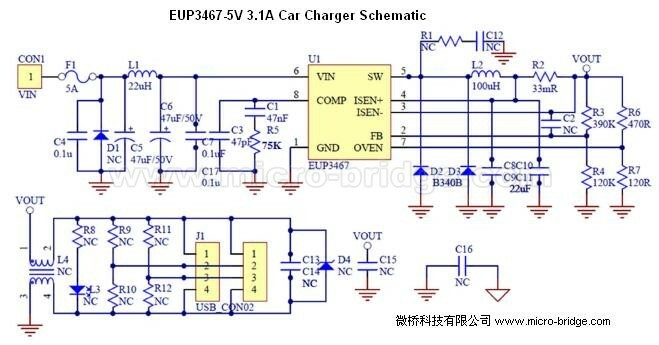 The EUP3467 stops switching when the output reaches over voltage threshold which is programmed by external resistor divider. Fault protection includes secondary cycle-by-cycle current limit, short circuit protection and thermal shutdown. In shutdown mode the regulator draws 3μA of supply current. Internal soft-start minimizes the inrush supply current and the output overshoot at initial startup. The EUP3467 is available in SOP-8 (EP) package.